It's 5:44am on Monday. I'm lying in bed eating Jaffa Cakes. I'm starving and it's the only food within reach. Everything hurts. Not as much as yesterday - I've just managed to get out of bed unassisted - but my lower body is not happy. Overall, I am pretty pleased with how my first 100-mile race went. Being the generous guy that I am, I gave my crew (girlfriend Cate and driver, sorry, friend, Ivan) the morning off to prepare for the day and night ahead. At 8am, I was picked up by Ilsuk and his wife in Fulham and driven to the start of the race in Richmond. Even nearly two hours before the start, Richmond town hall was buzzing, the Lycra legions getting ready for battle. After picking up my course map from James Adams (did you know he has a book out? ), I passed kit check with Gary Dalton and picked up my race number from Mark Thornberry. Having already said hello to Tim Lambert, I was on a roll with meeting friends from either real life or social media. So when I saw Sam Robson, I said hello which I think threw him since we've never met. Anyway, awkward introduction out of the way, he left me with the advice to "stay comfortable" as long as possible. Simple and sensible. I then bumped into (and met for the first time) Sarah Booker and after a short discussion about poo strategy, took her to a local cafe for a coffee. Back at HQ things were getting busier and as I stood around near the river, realised that I'd forgotten my sunglasses. It was cloudy but even so, after a week of kit prep it was a shoddy start. As the runners gathered for race briefing, Chief Cheerers Stephanie and Rhianon appeared to wish me luck - it was so great to see familiar faces at the start. Then Martin turned up, followed by media sensations Shaun and Susie. The latter has just discovered Periscope and interviewed me to an audience of 38 probably perplexed viewers. Race director James Elson did his race briefing (look after each other, it'll probably rain overnight) and we were off! Within two minutes of setting off, I needed a wee. I waited until we were near Ham before jumping into the bushes and watering the weeds. It coincided with my first walk break - the plan was to run for 9 minutes and walk for 1 from the start to a) stop my running muscles from tiring too soon and b) keep me slow. It's an ultramarathon not a marathon. I fell into step with Louise Ayling as I would on and off for the next few hours. It was good to chat with someone I sort of knew but little did I know just how many familiar faces I'd see over the next 100 miles. First there was Cat Simpson at Teddington Lock waving and taking photos. At the same point, my friend Gareth was there and he ran with me until Kingston with his dog. I suddenly worried I'd get reported for having an illegal pacer but it would have been the most useless time to have one (mile 2) in any race ever. Less than half a mile later I saw another friend Adam and his family walking by the river and I was starting to enjoy having supporters out on the course. We soon crossed the river and went past Hampton Court Palace and then we crossed again and I saw Sarah going into a pub. I later found out she wasn't well and couldn't finish due to illness, although my theory that she was stopping at every pub she saw for a pint was a lot more fun. 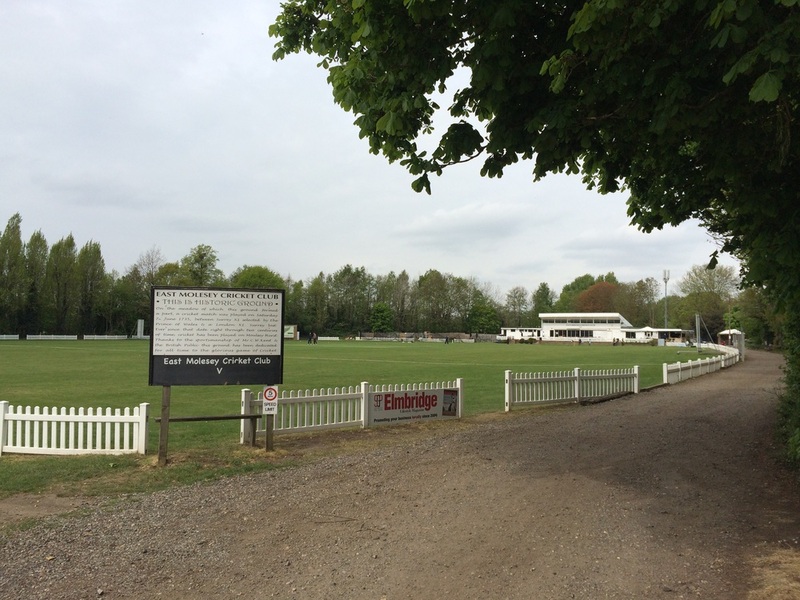 We passed East Molesey Cricket Club where I used to play football (obviously) for Spartak Molesey and brought back some great memories. Soon enough, I arrived at the Walton aid station, refilled my water bottles (or rather, Rich Goulder did), had some pork pie and sandwiches and went on my way. As I approached Chertsey bridge, I saw someone checking a note and watching the runners go by. When I got closer, I realised it was Tim (@JediRider) and he ran with me for a minute just to say hi and well done and that Bryan was a couple of minutes ahead of me. Again, it gave me such a lift to have people out there looking out for me. I was due to meet my crew at Staines but this got lost in translation and so we rearranged for Wraysbury. By this point I'd caught up with Ilsuk who thought I was ahead of him. I also saw Naomi and Piers and chatted to a few others as we pottered along the riverside and in the dappled spring sunlight we were now being treated to. As we came into the Wraysbury aid station I recognised Kate Jayden and said, "Ah, The Laminatrix!" as she'd told everyone on Facebook about her laminated split time sheets. She seemed to like her new nickname. A spot of lunch, a pair of sunglasses, a quick chat with my chirpy crew (for now at least - it was sunny, they'd just had an ice cream AND been to a Harvester for lunch. I know, the decadence!) and I was off down the path once more. Within minutes of leaving the aid station, I was treated to yet another supporter, this time in the shape of Jenni. She won the ladies race in last year's North Downs Way 100, her debut 100-miler, so it was great to see her and hear her saying how comfortable I looked. After a while, we crossed a road and I caught up with The Laminatrix and pointed out Windsor Castle which I had a feeling she might have missed running in her own little world. She duly stopped to take a photo so I felt justified in interrupting her. Most of the people I spoke to were aiming for a sub-24 time and were first-timers like me and while some were looking in fine fettle, others worried me a bit. Still, I did my best to be encouraging whenever I spoke to anyone and tried not to be too annoying whenever I had a burst of energy and overtook which happened a bit around Eton and Windsor. Soon enough I was back in familiar territory having done a training run here with Crossy last year. Out of nowhere the Dorney aid station appeared. The next crewing point was Maidenhead. We had to cross a main road to get there and it took me about five minutes, it was so busy. Finally I caught up with Ilsuk and as I'd seen a tweet from Seanie, I knew to expect him near Boulter's Lock. After a quick chat, we carried on and I stopped to change my shoes which seem to have got shorter. My toes were up against the end and I knew to address any issues sooner rather than later. There wasn't far to Cookham and after refuelling we were on our way again. Within a few hundred yards of leaving the aid station, a group of us found a dead end and realised we'd missed a Thames Path sign and some Centurion red and white course marking tape which led us up over a bridge. This is the only downside of running with and chatting to others - it's easy to get distracted and go wrong. I don't remember anything else about this section other than I was keeping on top of my food, water and salt intake. Food at all the aid stations, even if it was just a handful, sips of water every 10 minutes or when thirsty, and an S!Cap every hour, on the hour. Another apparently forgettable stretch, eventually some of this section became familiar, having done the Henley half marathon a few years ago, when 13.1 miles seemed like a million miles. Despite my constant grazing I was looking forward to a 'proper meal' and shortly before we reached Henley, I finally met Bryan who was also in need of some sustenance. I saw Ivan and Cate and then Cat and Keith and then James and Rich AGAIN (go home, man, you've done more than enough!). Batman topped up my water bottles with the help of Spiderman which confused me because I thought Rich Cranswick in his clown suit was the only one running in fancy dress. Then I realised they were volunteers and this was the theme and I really did need that bowl of pasta bolognese. I changed my tops, put on long socks and head torch and set off towards Reading. Almost as soon as I left the aid station, the sole of my right foot felt sore. A blister was coming. But rather than tell anyone and make it more real than it was, I just ignored it. Soon enough, there would be other pain to deal with. Also, I didn't have any way to get rid of it so I carried on. Susie: So how's it going? Justin: What? No, I'd like a piece of cake. Do you have any? In the end, I didn't say anything of interest at all as I was beginning to feel a bit weary. I had my bottles refilled by Paul Ali, saw Andrew Cooney making hot drinks, and found Tim Lambert sitting down looking a bit peeky. Turns out he'd been having stomach issues and was struggling otherwise I'm fairly sure I wouldn't have caught him up. Despite fatigue setting in, I was still about 30 minutes up on my sub-24 target so felt happy about that. Having recced this part of the course, running in the dark and rain was less of an issue than it might otherwise have been and although the miles didn't exactly fly by, I got to Tilehurst to meet Cate and Ivan in reasonable time and swapped my soaked gloves for ski mittens, an inspired impulse purchase some months previously. Warm inside and waterproof outside were perfect even if they did get a bit too warm now and again. At this point, I saw Claire and Dan, professional ultra supporters with their pom poms. Great to see them and astonishing really, given the horrible conditions. After navigating the housing estate, we were soon back down by the river and I caught up with Colin Barnes, recognisable by his hand torch and a walk that was faster than most people's run. We came into Whitchurch at about the same time and were soon followed by Ilsuk, Tim and a few others. As I made my way back onto the main road at Whitchurch, a marshal reminded me to switch my torch on. I said yes, didn't, and then got reminded sternly and immediately. I think it's because there was street lighting but maybe I wasn't functioning quite right by then. Anyway, the next section was the fun bit with a couple of hills and some winding single track. I fairly raced some of this as I think I'd had a rare caffeinated gel. I tried to stay on real food throughout and this worked well but maybe 3 or 4 gels didn't half give me a boost when eating became harder. To give you an idea of what I mean by 'racing', I still struggled to keep up with walking champion Colin and he disappeared into the night again when my head torch batteries gave out and I had to change them in the middle of a field. There's nothing quite like having no light source to remind you how far you are from civilisation. In fact, it wasn't that far at all and I was soon in the warm embrace of the Streatley aid station. I went to the disabled toilet (completely justified in my opinion) and then had some pasta and some incredible cheesy rice balls that I returned for more of after I'd left the building, thus briefly confusing the number checking volunteers. I didn't really need anything material from my crew at Benson, just a mile or so after Wallingford, but the morale boost was crucial. I was having to force myself to run now and someone was definitely elongating the miles because they could get away with it in the dark. At least that's what my addled brain was thinking. It was so fuzzy that I forgot to get the one thing I really did need and that was Vaseline. Again. Thankfully, I remembered I had a small jar that I was carrying and applied liberally to my chafed cheeks to huge relief. I think that saved me, although all I could think for the next 8 miles was, "Must wash hands before anything else at Clifton Hampden." This section was a blur at the time due to the persistent drizzle and now as well. All I can recall was that it was way too far between aid stations and I wished that I was fitter so I didn't have to walk as much. Finally, a hardy volunteer on a bridge pointed me to salvation and I met Cate (who handed over the Vaseline) and I sorted myself out. This was the first time I showed any sign of not being in good shape, but my quads were shot by now and 15 miles didn't feel close enough to the finish for it to give me a lift. It was only 4 miles to the next crew point though so I agreed to see them at Culham, a couple more miles before the penultimate aid station at Abingdon. This was another blurry section punctuated by a desperate need for a poo (successful in spite of getting a twig up my bum, sorry bushes near Culham), being cheered on by Dan and Claire again and telling Cate and Ivan I'd see them at the finish. It was light by now, which was good, but the rain was heavier and subsequently so was the ground which made progress even harder than it already was. Eventually Abingdon hove into view and after a brief pit stop I pushed on. I'd made it to 91 miles in 20 hours and 46 minutes. With more than 3 hours to cover 9 miles for my sub-24, I could have walked it in. Others around me had this plan and maybe I should have played safe and done the same. But although I was knackered, I wanted to get it done so still tried a bit of running every now and again. One such effort caused pain at the back of my left knee, not dissimilar to the muscle problem I'd had on the right side earlier this year. From then on, I walked. No sense in making it worse. The rain was still falling as I reached the final aid station and although I wasn't hungry, the team there insisted everyone eat as this is where it can all go wrong. I found a peanut butter white chocolate blondie thing which was heaven and set off for the final leg. Lower Radley to Lower Radley - 95 miles. Again. As I walked up the field by the river, my left leg started to stiffen up. It had been mobile before the aid station but apparently stopping wasn't a good thing. My strides became shorter and walking became more of a hobble. Uh-oh. What was that? I tentatively moved forwards. There was no sound but things - muscles? tendons? ligaments? - were moving unnaturally in my left leg. I found a fence post and leaned, stretching my leg. I massaged it gently. Nothing made any difference. I walked again. I looked at my leg. That didn't help. I figured it was about 4.5 miles to the finish. I regularly run a 4.5 mile loop taking in Putney and Hammersmith bridges along the Thames Path. I tried to imagine walking that in my current state. I shuffled forwards but my leg just wasn't playing anymore. It wasn't even that painful, it simply wasn't functioning like a leg should. I stood still wondering what to do. I could probably get to the finish eventually but at what cost? How much damage would I do? It was also cold and raining and I was no longer moving quickly enough to stay warm. I decided it was time to get back to warmth and safety and started the slow shuffle back to the aid station. As I did so, a steady stream of runners was coming the other way with that one-day buckle look in their eyes. There was a lot of sympathy for my plight and Tim even tried to persuade me to get there but it wasn't happening. I reached the haven that was the boat club and told them I had to drop out. I sat down, was wrapped in foil, covered in blankets and given a heater, coffee and some more of those heavenly blondies while I waited for my crew to pick me up. It's Tuesday now and my leg is improving but it's still a struggle to walk. The usual post-ultra pains are almost gone - it's just the injury left. So physically I'm not in great shape but mentally I feel good. I know I made the right decision to stop. I also know I can get that 100-mile buckle, be it in one day or a bit more. I think my race management was pretty much spot on, especially judging by some of the stories I heard and even other people I saw. Exactly two years ago I ran my first marathon so I've come a long way since then. Maybe I should have taken longer before getting into ultras but at 42 years of age, there's no time like the present. I don't regret any running I've done. In fact, running (almost) 100 miles is one of the best things I've ever done. It's really bloody hard but with the right training and a positive attitude it's totally achievable. I entered the race as I wanted to push myself to the limit and I think I did that. Perhaps I need to improve my overall strength so that this sort of injury doesn't happen again. I'm also keen to learn more about every aspect of running so I can continue to help other people fulfil their running aspirations. Thanks first and foremost go to my incredibly patient and supportive girlfriend and crew member extraordinaire, Cate. Second to Ivan, who drove them both around all day and night allowing me to indulge myself in this brilliant and ridiculous hobby. Third, to everyone who wished me well online and in person. Fourth, to all my fellow runners out there. Whatever happened at the weekend, you're amazing just for having the guts to get out there. Fifth and finally, the Centurion team for putting on a cracking event, looking after us idiots and being fantastic. Special thanks to you guys at Lower Radley. If I could just bottle the community spirit I felt all weekend, I'd be a millionaire. Of course, being community-minded I'd share it with you all. Next time, you will be mine. Oh yes.